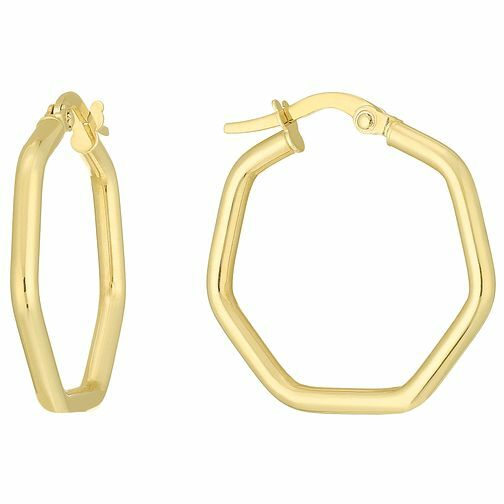 A contemporary take on the classic creole, this elegant pair of hexagonal creole earrings will add a little geometric chic to your look. Styled in rich 9ct gold and designed to go with anything. 9ct Gold Hexagon Creole Earrings is rated 5.0 out of 5 by 2. Rated 5 out of 5 by Anonymous from Nice earrings Lovely gold earrings. I wanted some that looked nice but that I could sleep comfortably in too...these are light and easy to put in the ear and do up. Look stylish too plus a good price.